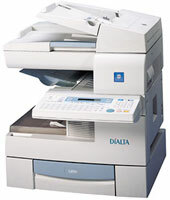 For small offices, home offices, and corporate departments or branch locations, Minolta's Di151 gives you a digital solution that's as powerful and cost-effective as your PC. Dimensions (WxHxD): 21-1/2" x 26" x 20-1/2"
Test Chart No. 1 (in standard mode).